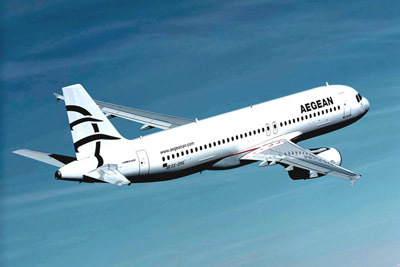 Welcome to Ithaca, the raw diamond of the Ionians, the mythical home of Homer’s Odysseus-the symbol island of nostalgia that inspired the great Greek poet Constantine Kavafis to write the homonym poem narrating in a unique way the journey of life, being an exquisite invitation for one’s seek for the inner personal Ithaca. A hilly island with alterations of scenery, dense vegetation, sheer cliffs, olive groves, deep blue Ionian waters, caves, archaeological monuments, forts, museums churches, monasteries and traditional settlements are all under Odysseus shadow. 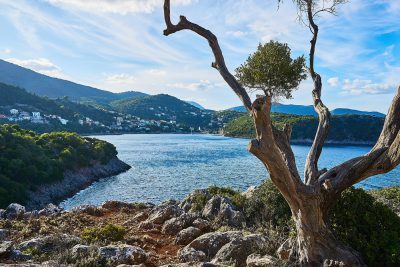 Visit the capital village of Vathi with its wonderful bay, the medieval castle and archaeological museum, to follow a stop over in Kioni a picturesque hamlet, a jewel of local architecture, beauty and tranquillity. Stavros houses the bust of Odysseus, Anogi an amazing church all offering beautiful pictures of nature and tradition. Beaches of exceptional beauty, clarity of shores and crystal clear waters, impress every visitor and offer the perfect setting for relaxing moments by the sea. 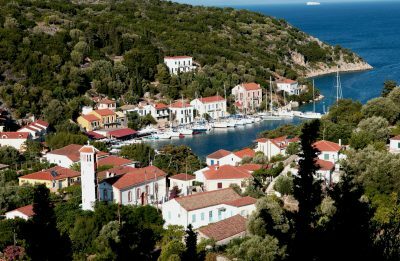 Although Ithaca remains unspoiled by the modern world and mass tourism, attracting mainly those who appreciate its natural and mythical beauty and tranquillity, options for entertainment are many mostly in Vathi. 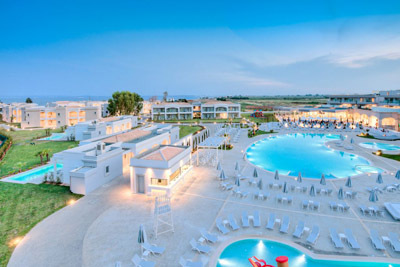 Being inhabited by one of the friendliest communities in Greece, the island offers warm hospitality at the luxury hotels and spas along with some of the best luxurious villas to be found in Greece. Ithaca has something for everyone; great beaches, hikes, boating trips, green lush vegetation, festivals and views, traditional food, entertainment, busy bars or quiet solitude. 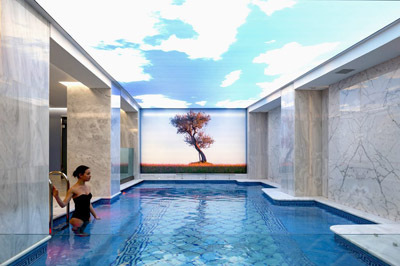 Tourist of archaeological interest, religious and natural, all find their own personal Ithaca at this place. As Odysseus did not forget Ithaca although he had visited amazing distant places, the same will happen to you after discovering its beauties. 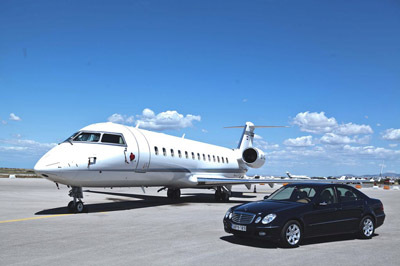 Ithaca can be reached by boat, as the closest airport of the area is the one of Kefalonia. 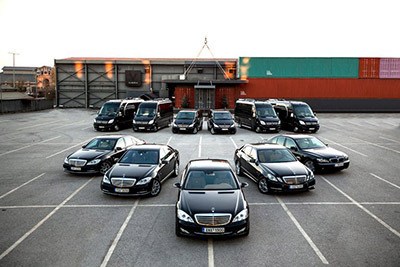 Ports providing regular services to connect with Ithaca are Patras and Astakos from the mainland and Kefalonia as well as Lefkada to link with the neighbouring islands. 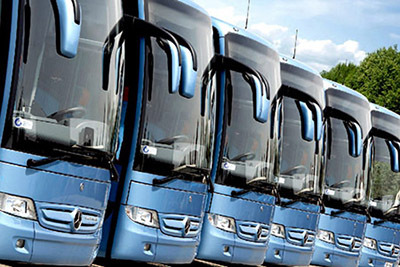 National bus services leaving Athens offer services daily. 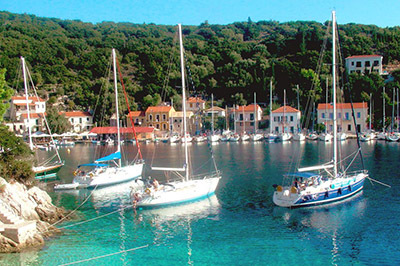 The capital village of Ithaca, Vathi is a picturesque settlement, ideally built amphitheatrically around a deep and leeward small bay, the centre of which hosts the tiny island of Lazaretto, a former sanatorium and prison where a small church can be found. Along the two entrances of the village one can see remains of forts and the harbour features Venetian style buildings, finely restored after the earthquakes the island suffered. South of the town, lovers of Odysseus legend can find the Fountain of Arethousa, the place where Odysseus’ swineherd, Eumaeus, brought his pigs to drink, while here is situated the house where Odysseus Androutsos, the 1821 hero against the Turks was born. The best kept secret of the island is the lovely little village of Kioni, situated in a verdant setting of incredible natural beauty of the surrounding hills. Ideal yachting destination, Kioni with its small tiled roofed, flower-bedecked houses and a small fishing port attracts those who can appreciate its unique beauty and tranquillity. Built on the top of a hill, Stavros offers panoramic views of the Ionian Sea and Kefalonia, while featuring impressive churches and most of all the bust of Odysseus proudly standing at the central square. The picturesque Polis Bay is nearby along with the Cave of Loizos, a former temple of worship to the Nymphs and Odysseus during antiquity. The hilltop village of Anogi is the former capital of the island proudly featuring the 12th century church of Agia Panagia with a Venetian bell tower and Byzantine frescoes. The surrounding area surprisingly houses some upright stones to reach up to 8 meters each. Finally Perachori is a scenic little village built at the edge of a forest to offer breathtaking views over the island, ideal for long walks between forests and medieval remains. The most important medieval town of Ithaca during the Venetian rule was Perachora, where remaining parts of the town such as residences of rare defensive style, Byzantine churches to include frescoes, still stand. Inhabited since the prehistoric age, Ithaca is an island of great archaeological interest. Two archaeological museums can be found, the Archaeological Museum located in Vathi to exhibit finds from excavations that took place at the southern part of Ithaca such as geometrical vessels, every day tools and coins, while the Archaeological Museum of Stavros, roofed under a 1933 building hosts important findings to relate the island with the legendary life of Odysseus. The Ancient Acropolis located on the top of Aetos hill is claimed to be Odysseus palace, still in doubt as indications lead to several other alternatives as well. An old building of electricity supply nowadays houses the Naval – Folkloric Museum of Ithaca featuring an incredible collection of over 1500 exhibits such as old photos collection, the old musical instruments, the local apparels, the household tools and the collection with traditional shipping equipment, proving the island’s historic naval tradition. Ithaca is also known for its unique churches and monasteries. The Church of Theotoko’s Dormition located in Anogi is one of the most important churches across the Balkans. Built during the 12th century, this basilica style church has been characterized as a tenable historic monument, featuring byzantine murals and an impressive Venetian style bell tower. The metropolis of Ithaca is said to be the Sacred Church of Panagia in Linovrohia with a wooden chancel screen of after-byzantine art along with the renowned bell tower with a beautiful stone structure, the latter being constructed for over 100 years. Finally the Monastery of Katharon, located at the same village where a local farmer came across the icon of Panagia in between the wild greens. A church was initially built there during the 17th century to follow the construction of the monastery. Ithaca, as situated in Ionian Sea, is a verdant island full of olive trees, vineyards and wild vegetation, ideal for hiking while exploring the unique monuments of the island. It is well worth exploring also the local caves such as the Cave of Nymphs which has two entrances, where according to the local tradition one is for the mortals and one for the gods. 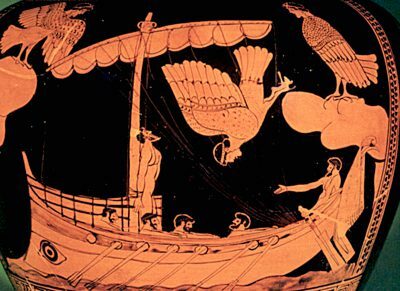 It was actually this cave where according to Homer, Odysseus hid Alkinoos’, king of Faiakes. 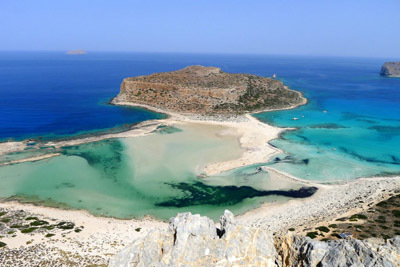 At the gulf of Stavros is the Cave of Loizos, a former port during the mycenaec, hellenistic and roman time, where an ancient town was sank and a religious center of protoelladic civilization. The beach lovers will take pleasure in a multitude of choices covering all tastes, from sand to pebbles, from rocky to green-clad backgrounds, from peaceful to busy ones, ideal for diving and snorkelling some to be explored only by boat. Organized beaches with sunbeds, umbrellas cantines and watersports to attract the majority of the visitors are Filiator, Loutsa, Poli and Dexia. 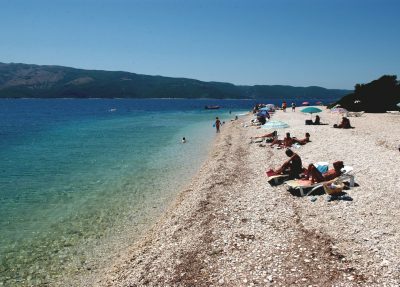 On the other hand the most beautiful beaches of Ithaca can only be accessed by boats which can be easily found at most of the island’s ports available for rental. 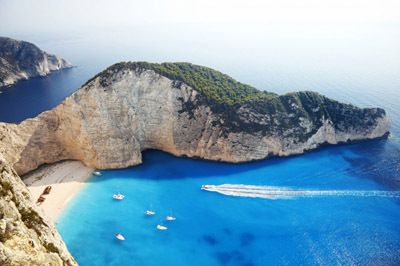 Gidaki is considered to be one of the best beaches in Greece with white pebbles and sharp green cliffs to be reached by boat, same as the beaches Afales and Platys Ammos. 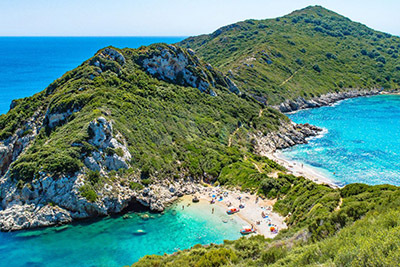 There is a number of non – organized wonderful beaches for the visitors to enjoy such as Aspros Gialos, the best sandy beach of Ithaca, Sarakiniko, Skinos and Aetos with a small harbour to link with Kefalonia and Lefkada. Ithaca is also wide known for its ”Panigiria” the local summer festivals with strong local participation where everybody is welcome to eat, drink and dance in order to get an essence of the Ithacaan culture and traditions. Ithaca offers a range of local specialities, well worth a taste. The locally produced olive oil, wine, eggs, goats meet and dairy products is thoroughly uses in this local cuisine that combines traditional Greek cooking with a pinch of Venetian influence. The main local delicacy is the Tserapa chicken, cooked in the traditional clay pot, while seafood lovers will adore the cod pie and Savoro fish, a fried fillet with raisins, garlic and rosemary, as well as onion pie and tomato balls. The local wine from the area of Perachori is of exquisite taste while for a desert give a taste to Rovani, the traditional sweet of Ithaca with rice, honey, sugar and olive oil.